North Carolina, known to those who live there as either the “Old North State” or the “Tar Heel State”, has its traditions and stakes in art, music, and cuisine. The North Carolina arts culture generates $1.2 billion dollars in economic activity for the state and is home to the North Carolina Museum of Art, the first major museum collection to be formed by state funding. Getting lost in all the artwork at the museum is an amazing experience; getting lost when searching for car insurance is not. Well, let us provide this road map for you full of every piece of car insurance information because we have put together a guide that has all the car insurance information that you’d ever want to know about North Carolina: coverage and rates, car insurance providers, state laws, and lots, lots more. So cook yourself up some of the state’s food staple (pork BBQ), and prepare to dive into the finger-lickin’ goodness of this guide. Comparing rates is a great way to save money! Start today with just your zip code. Speaking of food, North Carolina has a lot in terms of food firsts: Pepsi-Cola was first produced in New Bern in 1898; Golden Corral, a famous buffet restaurant chain, began and started in North Carolina in 1973, and the donut chain Krispy Kreme started in North Carolina. Before you go run out to buy a dozen delicious donuts, let’s go over the basic requirements of car insurance and what it will cost you in North Carolina. North Carolina ranks 48th in the United States when it comes to people who are uninsured. This equates to 6.5 percent of the total state population that is not insured. It is great that most of the state is insured! But whether you are insured or not, it is important to know that you need, at the minimum, liability insurance. Liability insurance covers you in the event you are in an accident and there is bodily injuries or property damage. It pays all the individuals involved. It is important to know North Carolina is an at-fault state. This means that the person who was at fault in the accident is the one who has to pay for any damage or injuries sustained. Also, if you work or do business in North Carolina, it is important to know you must have liability insurance you have purchased in the state of North Carolina. Out-of-state policies will not be accepted as valid insurance policies. $30,000 for injuries to one person. $60,000 for injuries to more than one person. This minimum liability coverage is known as 30/60/25. Experts recommend if at all possible to purchase more than the minimum amount for your state. To drive in North Carolina, you must carry insurance and some form of financial responsibility. A surety bond in the amount of $85,000 or more. Certificate of deposit of money or securities of $85,000 or more. Self-insurance (if you own/lease 26 cars or more). Every time you operate a vehicle, you need to have, on hand, proof of insurance and/or financial responsibility. If you let your insurance lapse, the North Carolina liability insurance law is heavily enforced. Insurance companies have to, by law, notify the state DMV if insurance is canceled or coverage lapses. There is no grace period for insurance lapses in North Carolina. The penalties for letting your insurance lapse? Restoration fee for license plate: $50 fee. If you need to cancel your insurance, for any reason, make sure you follow the proper procedures! It’s much better than having to pay fines and fees. In 2017, the average annual disposable income was $35,099. What is disposable income? That is the amount you have left to spend after you have taken care of your necessary expenses and after taxes have been paid. The average annual cost of car insurance in North Carolina is $768.28, which is about 2.2 percent of your total disposable income. If you live in North Carolina, your monthly disposable income, on average, totals about $2,924.92. On average, a full coverage premium will deduct about $64 out of your total monthly income. Why is full coverage so low in North Carolina? According to a study cited on the Charlotte Observer, North Carolina (as of 2018) is the least expensive state to buy car insurance in, as its residents pay 41 percent less annually than the national average of $811. North Carolina is mostly rural, which means less crime, cheaper cost of living, and fewer accidents. This drives insurance rates lower. The Commissioner of Insurance, Wayne Goodwin, is responsible for capping car insurance rates. Insurance firms compete with one another by offering rates lower than the state cap. American Consumer Credit Counseling suggests saving 20 percent of every paycheck. With North Carolina’s DPI, that is a whopping $585 each month! How much are you putting aside for savings? The above table illustrates the most recent data provided by the National Association of Insurance Commissioners. This data is as of 2015, so expect rates to possibly be a bit higher for 2019, and so on. Don’t forget: North Carolina has minimum requirements for liability coverage, but experts suggest drivers purchase more than what the state law requires, especially when the state is an “at-fault” state like North Carolina. Uninsured Motorist coverage is required in North Carolina. It is bundled with liability insurance, which is also required, by state law. Underinsured Motorist coverage and Medical Pay (Med Pay) are not required, but experts do recommend these optional coverages, as they can provide needed protection in the event something happens! Getting complete coverage at an affordable price is your main goal when it comes to car insurance, right? The chart below shows the states where women and men pay more for car insurance. When it comes to the states in gray, gender-based pricing is not allowed. North Carolina is one of those states. States where men and women pay more for car insurance. Made with the help of mapquest.net. There are a lot of car insurance providers out there, and it can be a pain to try and navigate who is the best, and who you can trust. Find out who the best providers are, and why, in the state of North Carolina. The A.M. Best Financial Rating lets you, the consumer, know the strength of a particular insurance company and how well they are doing financially. Sometimes it’s more important to know what people say about these companies instead of the financial data. You’re the customer, after all, and you need to be treated well! Read on to find out about customer reviews. J.D. Power and Associates conducted a study in 2018 that asked customers in several U.S. Regions how they would rank auto insurance companies. Every business gets a bad review every now and then. It’s only natural. But when there are multiple bad reviews and complaints, it’s wise to pay attention. The information above was gathered from Consumer Reports regarding the state of North Carolina in 2018 and cited on the Charlotte, North Carolina website for WSOC-TV. North Carolina has your back if you need to file a complaint. Go to the Insurance Complaints Website to file a complaint. When it comes to the cheapest annual rates, Liberty Mutual has the cheapest. It is middle of the road when it comes to customer complaints, and about average when it comes to financial ratings. You must decide, as the consumer, whether you feel paying less is getting your money’s worth! Liberty Mutual, again, seems to be the cheapest, no matter the length of your commute. Liberty Mutual seems to be coming out on top when it comes to good deals. For a high level of coverage, Liberty Mutual offers the best annual average. In North Carolina, your credit history can work for you or against you when it comes to purchasing insurance. Liberty Mutual has the best rates, no matter your credit history. If you have good credit overall, Progressive has the best rates. Much like with credit, your driving record can work for you or against you in North Carolina. Progressive has the best rates for a clean driving record. Accidents happen, and it seems like Progressive has the best rates if you have minimal speeding violations or minimal accidents. What in the world do domestic and foreign insurers mean? Domestic means that the insurer is in-state, or it may be an insurance company only available in the state of North Carolina. Foreign means out of state, or a company such as GEICO that is available in multiple states. In North Carolina, there are 56 domestic insurers and 855 foreign insurers. To keep rates on car insurance low, it helps to know the laws in North Carolina. Never fear! This guide will help you with knowing all the facts. Each state can have different rules and different laws, so it helps to read up on all of them. To stay in the know, read up on the North Carolina laws here. The sections below get a little more detailed. Oh no! The unthinkable has happened. That tiny crack in your windshield is starting to become a big one. Are insurers required to pay for windshield repairs? It looks like from research, yes, they are. North Carolina high-risk insurance is for people who have had past driving violations or no experience behind the wheel, or poor credit. Car insurance premiums will be high as a result. From research, it looks like insurance rates will either increase or decrease according to the North Carolina Safe Driver Incentive Plan. The Safe Driver Incentive Plan is the easiest way to get low-cost auto insurance in North Carolina. Be a safe driver, and enjoy the discounts! More information on the SDIP is down below. It pays to be a safe driver in North Carolina. If you drive safely, you save money. 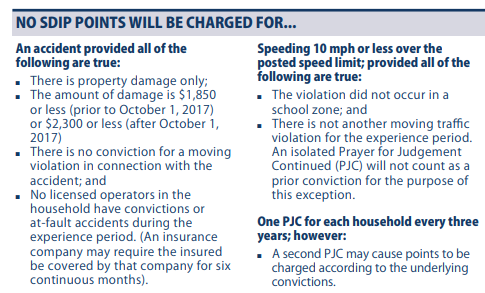 No SDIP Points will be charged if…according to the NC Department of Insurance site. However, if you rack up the points, your insurance rates will go up. 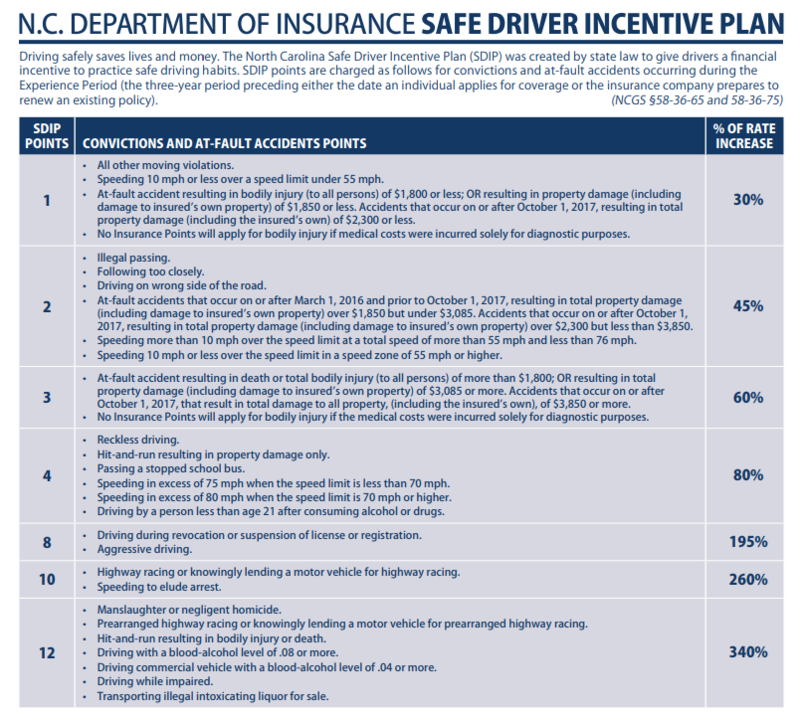 The North Carolina Safe Driver Insurance Plan, according to the NC Department of Insurance. The Department of Insurance in North Carolina is charged with protecting its customers from insurance fraud. Ten percent of all insurance claims involving some degree of fraud — totaling nearly $120 billion per year lost. Fraudulent billing of customers for medical services. The DOI is there to help you. However, they also want you to be proactive. How can you protect yourself? How you can protect yourself from insurance fraud in North Carolina. From the NCDOI website. If you are in any kind of accident, you have until the day of the accident to a set amount of time to file charges or file a claim. This length of time is known as the statute of limitations. It protects both you and the other party by giving each of you a set amount of time to bring charges forth. In North Carolina, the statute of limitations is three years for either personal injury or property damage cases. To be able to operate a vehicle in the state of North Carolina, you must have insurance, and also a license. Keep on reading to find out more about the specifics and the rules of the road. The penalties for driving without insurance are steep. First offense: $50 civil penalty; license/registration suspended for 30 days and $50 reinstatement fee; 45-day probation. Second offense: $100 civil penalty; license/registration suspended for 30 days and $50 reinstatement fee; 45-day probation. Third and subsequent offenses: $150 civil penalty; license/registration suspended for 30 days and $50 reinstatement fee; 45-day probation. Remember that you must have the required insurance and/or forms of financial responsibility in your vehicle at all times. If you are the parent of a teen driver, or if you’re a teen driver yourself, it is important to know that a teen cannot get a full-fledged license right off the bat. If you are between the ages of 15-17, you go through a process called graduated licensing. It is a series of strict requirement teens must follow before they can receive a full driver’s license. What are those requirements? Find out in the table below. Have a minimum age of 15. Pass a driver's education course. Receive a driver's eligibility and a driver's education certificate. Before getting a license or restricted license you must: Have a minimum age of 16. Have a mandatory holding period of 12 months Have 60 hours of supervised driving time. 10 hours must be at night;. Important to know: if you are younger than 18, you are banned from using a cellphone to talk or text. The texting ban is primarily enforced for all drivers, no matter your age. The rules for older drivers in North Carolina? Pretty straightforward. Proof of vision required: every renewal. Mail or online renewal permitted: Yes, for every other renewal. You can save yourself a trip to the DMV every five years by renewing online. Now that’s what I call convenience! You must register and title your vehicle, as well as get a North Carolina license, within 60 days of moving to the state. You should also familiarize yourself with the North Carolina driver’s handbook since every state is different with their laws and regulations. When it comes to renewing your license, you must have a current or expired license with you at the time of renewal. If you do not have these, you must present two forms of identification. The North Carolina DMV will make sure to send you a renewal card 60 days before your license expires, but you can renew your license 180 days before its expiration date. Good news! If you don’t have a restriction on your driver’s license and if you have a Class C driver’s license, you can renew online! Starting October 1, 2020, federal agencies will endorse what is known as the REAL ID Act, which requires you to have a REAL ID U.S. Passport or another federally approved ID to board flights or enter federal buildings. What a REAL ID looks like. From the North Carolina DOT Website. In North Carolina, a REAL ID is optional and not required to drive, but it is recommended if you fly a lot in the United States. Here is what you need if you want to apply for a REAL ID in North Carolina! Remember, North Carolina is an at-fault state. This means that the person who was at fault in the accident is the one who has to pay for any damage or injuries sustained. North Carolina takes seat belt and car seat laws VERY seriously, as they are primarily enforced. This means if a police officer sees you not wearing your seat belt or doesn’t see a child in a car seat, they will stop you. If your child is 7 years old or younger and less than 80 pounds, they must be in a car seat. If your child is 4 years old or younger and less than 40 pounds, they must be in the rear seat. A $25 fine applies if you are not wearing your seat belt or if your child is not in a car seat. In North Carolina, the speed limit is 70 miles per hour on rural interstates, urban interstates, and other limited access roads. All other roads have a limit of 55 miles per hour. In North Carolina, you can quickly find commute partners with the use of their website! When it comes to automated vehicles, North Carolina is one of 12 states that have authorized the full deployment of automated vehicles. Depending on the level of automation, an operator may or may not need to be licensed. An autonomous vehicle in North Carolina does not require an operator. Autonomous vehicles in North Carolina do require liability insurance. North Carolina’s DWI Laws are some of the strictest in the United States. You are considered Driving While Intoxicated if you have a BAC of .08 or higher (if you are 21 or older) or .04 if you are a commercial driver. Younger than 21, any BAC is considered Driving While Intoxicated. Level V: $200 fine, a minimum jail sentence of 24 hours and a maximum of 60 days. Level IV : $500 fine, a minimum jail sentence of 48 hours and a maximum of 120 days. Level III : $1,000 fine, a minimum jail sentence of 72 hours and a maximum of six months. Level II: $2,000 fine, a minimum jail sentence of seven days and a maximum of one year. Level I: $4,000 fine, a minimum jail sentence of 30 days and a maximum of two years. • Three DWI Convictions within the past seven years. • Serious injury caused while driving. • Death caused while driving. The penalty is a minimum of one year in state prison. There is no marijuana-specific law in the state of North Carolina, but it doesn’t mean you won’t get in trouble for driving under the influence. However, in 2018, 123 deaths were attributed to distracted driving. With this in mind, North Carolina lawmakers are now pushing for the Hands-Free NC Act. So many new pieces of information and facts! But we’re not done yet. The Honda Accord takes over the number one spot for the most stolen vehicle! The best way to stay out of danger on the roads is to drive defensively and be aware of common issues in North Carolina. Weather and the time of day can contribute to traffic fatalities. In normal weather conditions, during the day, North Carolina had 619 traffic fatalities. There were fatalities in other instances, but remember to always keep your eye on the road! This shows the fatalities over the course of five years. This shows the fatalities over the course of 10 years. Interestingly, rural areas have a lot more traffic fatalities than in urban areas. This may be due to the fact that North Carolina is mainly a rural state. Passenger cars, motorcyclists, and pedestrians have a high rate of fatalities in this five-year timespan. Remember, the DWI Laws in North Carolina are some of the strictest in the United States. The response times in both rural and urban areas are excellent. Both areas take under an hour from the time of the crash to hospital arrival. Most people in North Carolina live in a two-car household. With an average commute time of 23.1 minutes, North Carolina ranks above the national average! 1.8 percent of North Carolina residents report a super-commute, which is spending 90 minutes or more of your time commuting. 86.1 percent of the workforce report driving in to work alone. 9.2 percent carpool, and 5.4 percent work at home. By the year 2040, North Carolina’s population looks to increase by 3 million, according to North Carolina DOT (as cited by WRAL). This is why the DOT is gathering data from North Carolina residents so it can better plan for the future. When it comes to traffic, only two North Carolina cities are the worst: Greensboro and Charlotte rank 209th and 91st, respectively, for the worst traffic in the WORLD, according to the INRIX Global Traffic scorecard. Greensboro residents lose 43 hours a week (almost totaling two days) to congestion, whereas Charlotte residents lose 95 hours a week. That’s a total of almost four days! And according to experts, congestion in Charlotte is likely to only get worse. Want to get a first-hand sense of just how bad traffic congestion in Charlotte is? Want to see further stats on how bad North Carolina traffic is? In Greensboro, drivers see an increase of 9 percent extra travel time. This amounts to minutes extra minutes per day and 33 extra hours per year. When it’s morning traffic, drivers see an increase of 11 percent extra travel time, and in the evenings, drivers see an increase of 17 percent extra travel time. Highways seem a bit easier to travel on, as they see a 2 percent increased as opposed to non-highways, which see a 17 percent increase. In Charlotte, drivers see an increase of 17 percent extra travel time. This amounts to 23 extra minutes per day and 90 extra hours per year. When it’s morning traffic, drivers see an increase of 28 percent extra travel time, and in the evenings, this increase nearly DOUBLES at 48 percent. Highways seem a bit easier to travel on, as they see an 8 percent increased as opposed to non-highways, which see a 27 percent increase. Traffic index: Time consumed in traffic. Time index: the average time, one-way, that is spent in a commute. Inefficiency index: estimation of “inefficiencies”, such as people driving a car instead of carpooling or taking public transport. These factors are not listed for Greensboro, but they are for Charlotte. Time index (in minutes): 38.02 minutes. We hope this guide about car insurance and the rules/laws in North Carolina has helped you!